In honour of CSE's fifty years (this month) in the Sir Leonard Tilley building, here is part one of a brief (well, it was supposed to be brief) tour of CSE’s facilities, past and present. 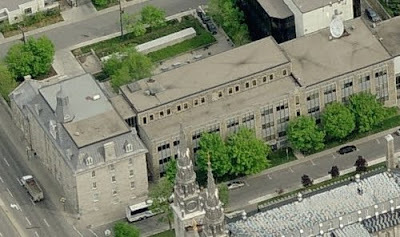 The first headquarters of the Communications Security Establishment, or Communications Branch of the National Research Council (CBNRC) as it was then called, was in the La Salle Academy on Guigues Street (now Avenue) at Sussex Drive. The site was first used for signals intelligence purposes in August 1943, when the third floor of one wing of the school was occupied by the Army, Air Force, and Navy Discrimination Units. The building also soon hosted a Joint Machine Unit, which operated Canada’s first code-breaking machines, the forerunners of CSE’s massive computer arrays of today. On August 1st, 1945, the Army and RCAF Discrimination Units, the Joint Machine Unit, the Japanese processing elements of the Examination Unit, and a communications and cipher office were amalgamated as the Joint Discrimination Unit (JDU). The JDU was renamed the Communications Research Centre in July 1946. Still housed in the La Salle Academy, the CRC formed the core of the CBNRC on the latter’s creation in September 1946. At its moment of birth, CBNRC had a staff of 62, most of whom had simply transferred from the CRC, many becoming civilians in the process. CBNRC had an approved establishment of 179, probably slightly higher than the peak number of personnel at the site during the war, but post-war recruitment was slow, and staff numbers reached that level only around the time the agency moved to its next location, in January 1950. The present-day building consists of multiple, joined structures. The structure on Sussex Avenue (on the left in the photo above) was built in 1852 as the College of Bytown, which eventually became the University of Ottawa. This building subsequently went through several uses before becoming, in 1899, the La Salle Academy, a Roman Catholic school for boys. 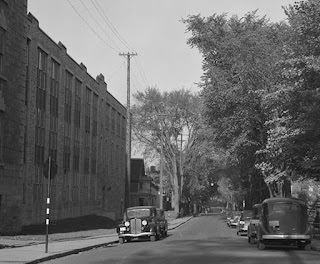 The long wing along Guigues Street (on the right in the photo; see also below) was built in 1934 as classroom space for the Academy. Later additions were made in the 1960s and afterwards, and the entire building is now heritage designated. Since the 1970s it has hosted a variety of government offices. 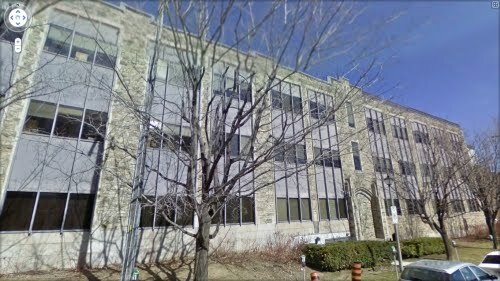 As far as I can tell, CBNRC and its predecessors occupied only the 3rd floor of the 1934 structure during most of their tenure in the building (image from Google Street View). The 1934 structure is now connected on several floors to the original 1852 building, but at the time it was a free-standing building, and I am not aware of any evidence that CBNRC ever occupied any space in the 1852 structure. By 1949 or earlier, the agency expanded to occupy two classrooms on the 2nd floor of the 1934 building. However, it was forced to relinquish that space in September 1949, a few months before it left the La Salle Academy entirely. It appears therefore that CBNRC had only about 1250 square metres of space to house its staff (or about 1430 after the expansion to the second floor). By today's standards, that would provide enough space for about 50-60 people, perhaps 70 given that the furnace room and other utilities were located outside CBNRC's spaces; it seems clear that even by the standards of the time the agency must have been facing considerable crowding by the time it moved out of the Academy. In addition to space issues, CBNRC also had a problem with disposing of classified waste at the site. It is likely that the government never intended the La Salle Academy to be the CBNRC’s permanent post-war home. Incredible though it may seem given today’s approach to security, Canada’s then ultra-secret signals intelligence agency was not alone in the La Salle Academy. As the History of CBNRC attests (Chapter 26, p. 6), the Catholic boys’ school continued to operate in the building during the entire time CBNRC and its predecessors were there. Indeed, the reason CBNRC had to withdraw from the 2nd floor was that the school needed its classrooms back. It seems unlikely that the Soviet embassy turned down a chance to attend. CBNRC employees also took advantage of the theatre’s presence. 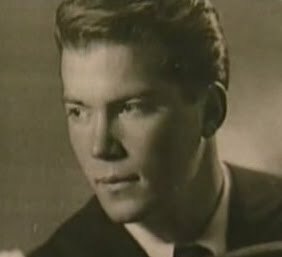 Writing many years later in CSE’s in-house newsletter, Gwen Flahven, one of the employees from that time, recalled “watching rehearsals in the theatre below and meeting Christopher Plummer, William Hutt, Betty Leighton, William Shatner, and other actors and actresses” (Tillian, Spring 1980, p. 11). [Update 29 October 2016: This photo, possibly dated 1938, shows what the building looked like around the time it was occupied by CBNRC and its predecessors. The number of people on CBNRC's staff continued to grow throughout its time at the La Salle Academy. Late in 1947, the agency's establishment was increased from 179 to 227. CBNRC had not yet reached that number by the time it left the Academy in January 1950, however, and it is unlikely that it would have been able to accommodate them all if it had. As early as August 1948, CBNRC Director Ed Drake had called the President of the NRC, C.J. Mackenzie, to complain "about his cramped office space" (Mark Kristmanson, Plateaus of Freedom: Nationality, Culture and State Security in Canada, 1940-1960, University of Toronto Press, 2003, p. 108). For space, security, and perhaps other reasons (the school may have wanted its 3rd floor back), it was clear that CBNRC could not remain permanently at La Salle Academy. In August 1949, the Department of Public Works let a contract for "extensive alterations and improvements" to the Rideau Military Hospital to accommodate both the Communications Branch and the Division of Radio and Electrical Engineering of the NRC, and by the beginning of the next year CBNRC had moved to its second headquarters site.